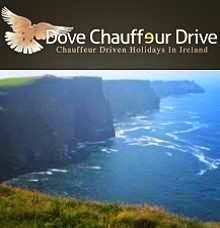 HOLIDAYS in IRELAND: Personal Chauffeurdriven vacations/ professionally tailored to your own desires. Personal Chauffeurdriven vacations/ professionally tailored to your own desires. The Wild Atlantic Way is the route covering the western coastline of Ireland, from West Cork to the northern regions of lovely Donegal. I was born and reared in Galway, which is located about half way up this beautiful coastline. The west of Ireland is a land of mountains,bogs,lakes and valleys, and eventhough it is very beautiful, the land in this area is not the best for farming, being rough and rock strewn. It was on this coast that the ice age deposited its rubble when it melted. This was the area into which Cromwell drove our people from the rich farm lands in the midlands and the eastern side of the country. How they survived on the patches of ground that were workable is still a mystery. Many of then did not survive, and when the famine hit, emigration was the only option. Yet these brave and courageous people held on to their religion. their customs, their music, and of course their Irish language. I am putting a link on my Blog here below, which features me being interviewed by the owner of a website called Bitesize. Eoin O Conchuir, the founder of Bitesize, contacted me and asked if i would be prepared to make myself available to do this, and because Bitezize is an Irish language teaching site, which he set up to help to encourage people anywhere and everywhere, to learn, and help to preserve our native tongue, I was only delighted to help. As a native Irish speaker myself, I can only wish them all the success in the world. Just click on the link below. I hope you enjoy the interview. The address above should get you to the Bitesize website. If you have any comments to make, please do. People seem to be having difficulty in posting on my Blog. Just log in , write your comment and post. You can also write to me personally by going into my chauffeurdriveholidays.com website.